Thank you for your visit to Daredevil's Lounge, and for taking the time to fill out this survey. 1) How did you find the welcome, rating from one to five where one is "very poor/nonexistant" to five "extremely warm and inviting". 2) Please rate the quality of drinks out of five, where one is the lowest and five the highest. 3) Please rate the speed of service out of five, where one is the lowest and five the highest. 4) Please rate the general atmosphere out of five, where one is "poor" and five is "excellent"
5) How likely are you to return to Daredevil's in the next two weeks? Please rate out of five, where one is "very unlikely" and five is "very likely". 6) Would active racing events make you more likely to return? Please rate out of five, where one is "no difference" and five is "definitely". 6a) Do you consider yourself to have a roguish streak? Please rate from one to five where one is "no" and five is "Frankly, my dear, I don't give a damn." 7) Please use the space below for any further comments. Working in a bar was... different, Laria considered, laying back on her bunk and staring at the ceiling. She notices a rust line creeping along the join between two of the plates, and fought down the urge to get a step-ladder and some wire wool to polish it away. These quarters were only temporary. It was nice to get to meet people, though. Even if most of them varied between unscrupulous and downright evil. Perhaps some were merely prisoners of the choices they had made. Perhaps everyone was, in the end. She'd chosen not to do what her parents wanted, to become a capsuleer, to join the University and then to leave. And that had got her here. And if the people who came into the bar were literally prisoners of those choices, then perhaps all they needed was the opportunity to find another way of life. To leave behind their mistakes and find a new way. It wouldn't be easy, though. It required trust, and that was the scarcest commodity in New Eden. She couldn't go about it in an obvious way. She had to befriend them, be a figure that they could believe in. Prove the benefits of living a good life, show that it could be exciting, profitable. There. That was it. That was sassiness, surely? Blazing a path through the galaxy, dragging the lost back to the light in her wake. She sat up, quickly, and bumped her head on the shelf above the bunk. Ignoring the pain and the weird flashing in one eye, she got out her datapad. This idea required a list. Laria switched off the holovid with a frown on her face. Sassy adventuresses were not just sudden death in their spaceships (she shoved aside the thought that most of the "sudden death" that happened in her ship was her own), but also when running through rapidly disintegrating industrial facilities, wielding guns in both hands and simultaneously performing acts of gymnastics. She was actually pretty good at cartwheels and somersaults, even if she didn't always end up facing the right way. But... she'd never actually handled a firearm. There was a crate of them, rescued from the clutches of the Angel Cartel, somewhere in her "Miscellaneous" station container, but she rather felt that the station authorities would disapprove of her opening it and firing in the hangar. She thumbed the station directory. There! A firing range. With lessons. She was pretty hot with a small blaster turret, and they weren't that dissimilar. How hard could it be? Well! That was an experience. Surely when the instructor said she was "The most dangerous person I've ever seen here" it was some kind of compliment. It was better than being /average/. Still, the banging noises had been surprisingly loud, and her forearms ached quite badly. Perhaps she could be the kind of sassy adventuress that eschewed the use of guns. Maybe /knives/ were more her style? Worth a try, anyway. I haven't seen anything that puts together what we learned about CQ and Incarna at Fanfest. I attended the Character Creator presentation, the Captain's Quarters Presentation and the Character Creator Round Table, as well as the keynote speech and CCP presents. I'm not sure there's anywhere I could have gone to get more info, but some people probably did! Here we go: Captain's Quarters. In the summer expansion, we get Captain's Quarters. These represent the transient Captain accommodation you get free with your docking fee. There will be one per race, and which one you're in depends on the controlling race of the station you're docked in (no idea about lowsec player stations, as I don't know how they work). The existing UI is still present, and will load ahead of the CQ, which essentially replaces the ship + hangar view you have at the moment. You will lose the ability to ship spin. It may come back later. You will be able to move around freely and sit down, and the camera will move under your control. The reason for this (somewhat limited) functionality is that under the hood, it's quite a lot - ambulation of your character, controls, environment building, interaction with the environment, rendering of your character in game, etc. It's clearly focussed on the new player, though the holo screen is kind of cool for everyone. The CQ at this point is basically entirely client-side, with no communication about your movements or anything to the server. The ability to upgrade your quarters to bigger ones. Possibly some limited customisation of CQ.. Establishments. Both NPC and PC controlled establishments, customisable with layout and with corp logos. To go with this: a change to boosters (essentially revamping them entirely), the removal of NPC customs agents and the putting of customs checking into PC hands - essentially, you'll be able to scan people down and, if they're carrying contraband, flag them as smugglers. As a result, trading of illegal goods will be possible in hisec stations but only on a face-to-face basis. More hairstyles, clothes (in collections) and accessories. Asset creation is actually quite hard, because they really want it to look good. It is intended that it will be possible for there to be limited customisation of clothing, possibly including colour changes (within a limited palette) and putting corp logos onto jackets, etc. There are some issues about tradeoffs between quality and flexibility that are still very much in flux (see: Height issue). The further you get down this list, the more the "will include" has the word "hopefully" and "maybe" attached. All things that are resellable will be destructable. So, you will be able to sell your jacket, but probably not your tattoo (ouch). (Note: in this way, micro-transaction bought clothes might be regarded as one way mini-plex). There was not much talk about what will be micro-transaction and what will be free and what will be isk-buyable. There. That's about it. Feel free to ask any questions while my memory is still fresh. I went to fanfest! I had a great time, drunk too much beer, talked too much, danced a bit. (Your definition of dancing and mine may differ). Will definitely try to get back next year. I hope that the whole plan for Incarna + Smuggling + Contraband + Customs goes through. All of it, and not just some bits, because it made a lot of sense, fit in with the world as I understand it and would possibly give a jolt in the arm to whole sections of the game. I was disappointed by seeing a couple of people in the flesh. Shorter than I'd anticipated and... just dudes. And, in one case, a rather disrespectful and condescending dude. I wish there was a high-definition version of the video available. There were too many people at the Party on Top of The World, and it stopped feeling like an EVE event and started to feel like an Icelandic-drunk-teenager event. Laria felt a catch in her throat as she acknowledged the "Transition Complete" signal from the gate. 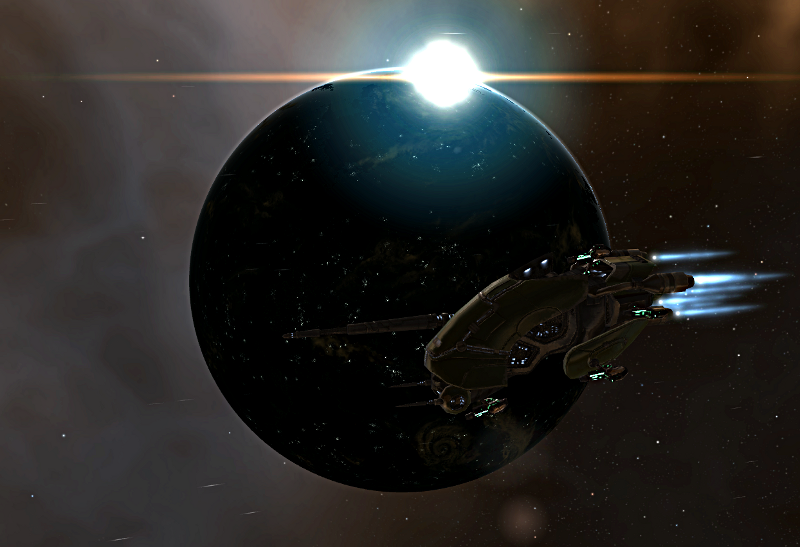 The wounded heart of the Gallente Federation, and somewhere, deep inside her, still home. She set an elongated course to the one Gallente-controlled station in system, including an extended flypast of Gallente Prime. The last time she had been here, she had still been undergoing basic pilot training at the University of Caille, now she was returning as a fully-fledged capsuleer. It was a dry, saddening feeling. "Say hello to your prodigal daughter," she thought, gazing at the sun-lit rim of the planet. She let the tiny Ishkur orbit slowly, her camera drone moving lazily around the ship. Caught between the sun and the planet, between here and there... between a child and an adult. She flicked the ship angrily onto a different course. Indecision was next to inaction, to denying responsibility. She would become what she wanted to become, and she would achieve what she wanted to achieve. One step at a time. "How much!" Laria exclaimed, staring at the woman holding up the garment for her. "Madam will understand, this is made by one of the finest designers..."
Laria waved her hand. "No no. It's a fifth of the cost of a Small Armour Repairer. I was just surprised. I'll have six." This was definitely a new experience. She knew, intellectually, that as a capsuleer she was extremely wealthy, but in general she'd been dividing things into "so cheap I don't have to worry" - food, quarters, etc and "expensive" - new Ishkurs, etc. This was the first time she'd come face to face the realisation that something that had been in the latter category could rapidly move to the former. Still, she had better be careful. There were a lot of shops on the Crystal Boulevard, and that could soon add up to serious money. It was waiting for her when she got back up to the station, some days later. Absurdly, it was on paper - not a datachip, not a download to her pad. On paper. Hand-written. With "Do Not Pass This On" on a sticker on the front. Laria smiled, and carefully secured it in a sealed cannister that not only would be carried /in/ her pod, but had a beacon so that if the absolute worst happened, she still had a chance of finding it. It was much safer than putting it in the hold. And much more possible, actually. It turned out that there were quite a lot of sassy outfits and items available on the Crystal Boulevard. Almost more than could easily fit in the hold of the small frigate. Maybe she should have brought the industrial. Still. Time to head back. Time to get active. This was all going surprisingly well, Laria thought. Yes, she'd gotten drunk, and yes she'd made a bit of a fool of herself, but nobody seemed to mind drastically, and sassy adventuresses were often having big nights and regretting what they'd done in the morning. And then, then next time she'd been to Daredevil's, to actually work, it had gone remarkably. She had definitely managed to make several sassy comments. And several embarrassing ones too, but best not to dwell on those. Laria pulled up her list on her datapad. Well, two items only just makes a list, but it was early days, and auditions for the role of "Nemesis/One True Love" would have to carry on for some time. Candidate Number One. Positives: Reasonably good looking. Has shady past. Owns bar. Negatives: Nice. Doesn't seem to have a very shady present. Poss. too close? Candidate Number Two. Positives: Definitely a villain. Negatives: Almost repulsive. Might be nasty rather than roguish. Slight possibility of kidnap + brainwashing. Laria put the list away. Not going to get any further with that today. She looked around her quarters and frowned. Cia had expansive, beautiful quarters. And Laria had quarters that looked like she didn't have enough belongings and anyway was only going to be here for a short time. There was only one thing for it. Another list. Buy nice sassy things to put in quarters. That seemed reasonable, and postponed the question of what exactly was a sassy item of furniture to a later date. "What're you doing here, little girl?" A surly voice, with a hint of mockery running around the edges. Laria frowned, and put a foot forward. "I just want to go about my..." (count 1, count 2, count 3) "...business." She flashed a smile, letting her lips part slightly and her head tip forward. "If you don't..." (count 1, count 2) "...mind." Suddenly, she stomped her foot on the ground. "No! No no no!" She shoved her hands angrily toward her pockets, missed, and settled for clenching her fists. "It's only a count of one between "don't" and "mind"." She stomped again, for good measure. She sighed, forcing herself to calm down. "Ok, replay scenario." The computer displayed a countdown from 5 seconds, while Laria arranged herself back in her initial position. "Focus," she said to herself, a concentrated expression appearing on her face. Just as the countdown reached two, there was a beeping noise. "Stop scenario," she said, heading over the console. New mail! A reply to her advert. She opened it, heart beating. Not... disappointing, but not cartwheels either. Still, if he had his own bar, it was a decent start. If only she could be sure he'd know the right lines. Not every child of a family with a long tradition in a business revolts and strikes out in her own direction, pursuing her dteams. Even if that's what her family want her to do. The Ravens have been miners for generations. First as part of the Rowan Mining Corporation, and then, for the last one hundred years, as an independant, the Raven Mining company. Laria's parents wanted something better, or at least something other, for their only daughter. An actress, perhaps. Or a famous scientist or lawyer or politician. Anything but another miner, infatuated with the lucky strike, desperately seeking the mother lode. Blood tells, though, and after having qualified for entrance to the University of Caille in secret, Laria set out as an independent miner herself, making her own way in the world she's been immersed in since childhood. After a few months, her application was accepted by Eve University, where she studied, learnt and flew around with just a few dozen of her closest friends, until itchy feet and a sense of closure caused her to look around and move on. Drawn to Re-Awakened Technologies Inc by a curious case of hero worship, she applied and was accepted. The year and a half that followed was more or less a happy one, despite the object of her hero worship not really being present. It was during her time with Re-Awakened that, after a meeting in a bar that a corp-mate was caretaking, she started dating the notorious (EDIT: EVIL DUMPING) pirate Vincent Pryce. A short time later, her heart well and truly broken, she was single again. 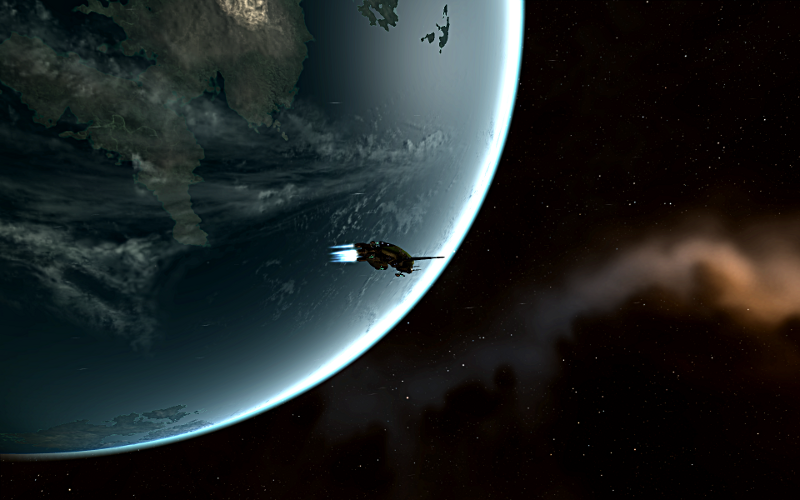 After a year and a half in Re-Awakened, she struck out with a few others and helped form the corporation "Stormcrows", moving to Caldari space. Although not a loyalist corp, over time, it became obvious to her and others that she wasn't the perfect fit there. She showed signs of boredom, including an ill-advised affair with (NAME REMOVED - TOO EMBARRASSING - LZR). It was in a chance encounter between her Stabber cruiser and his large gatecamp that Laria met with Vince again. What he said to her, or showed her, is unknown, but in a shock move, Laria repudiated the empires and, leaving Stormcrows, joined the Angel Cartel loyalist corp Utopian Research Independent Experimental Laboratories (URIEL). Whatever she's doing there, it appears not to involve much time with rocks and strip mining lasers. The project seemed to be proceeding nicely, Laria decided, taking a gentle sip from her glass of "Pator Number One" and screwing up her face in disgust. That was definitely less awful than last time. In only a few days, she might even have acquired sufficient of a taste of it to not have to spit it out almost immediately. So. She had a sassy stance, and a good walk. She was learning to drink an appropriate drink. This was all going very well indeed. What next? She looked around her quarters, her gaze returning to the large poster of Evanda Char. What did she /do/? Well. There was the space-spanning, love-hate complex relationship thing. There. That was a thing to do. An epic, world-shaking love affair. Who with? Laria bit her bottom lip. It had to be someone not... smelly. With a hint of elegance, or at least... she waved a hand, communicating with nobody in particular. With at least /some/ sophistication. And a vocabulary. No. Nobody. Nobody came to mind. So. She would need to advertise. Idealistic adventurerss seeks urbane sophisticate with roguish streak for universe-spanning epic. Must bring own drones. Sassy idealistic adventuress seeks urbane sophisticate with roguish streak for universe-spanning epic. Must bring own drones. There. That was worth risking another mouthful of "Pator Number One" to celebrate. Laria strode through the door, glanced around with what she hoped... no, squash that... glanced around nonchalantly and headed for the bar. She leant against it, resting her hand on her hip, one knee slightly bent, just like she practiced. "Straight Pator Number One," she ordered. A tough drink. The barman slid it across the polished metal surface, and Laria managed to react just in time, catching it before it fell off the edge. Close. She knocked it back, and slapped the cup back onto the bar. Her mouth exploded into a ball of fire. This was horrid! Horrid and painful. She clamped her jaw shut, calling on all her self-control. Tears, unwanted, escaped from the corners of her eyes. A guy stood up, walked towards her. This was it! This was the opportunity! She was going to get a chance to be sassy and cool! And she was going to totally ruin it all by being unable to speak because her mouth was burning like she'd gulped propellant. Quick. Think! Laria blinked back the tears, nodded to the bartender as she pushed herself to a stand, looked at the approaching guy, winked, and headed from the bar, giving all of them a good look at her new walk. There. That wasn't a total disaster. Laria looked at herself in the mirror, safely back in her quarters, and having rinsed and spat more times than she cared to think. She nodded, and gave a little wry grin. Hey, that looked good too. A little more practice, that was all she needed. Wait. A gnawing fear tugged at her gut. When she'd winked at the man... prior to her stylish exit... had she winked with the correct eye? The concept of "sassiness", Laria decided. was one that she was still having trouble with. Mining, yes, she could do that. But somehow the hours spent in the night, her Retriever lit with the orange coruscating light of her strip miners, as potentially enthralling as they were, didn't quite seem... well... "Sassy". Nor did getting assault frigates destroyed, she thought ruefully. That was getting to be a habit, and one she needed to get over in a hurry. Eva wouldn't have thought getting blown up was sassy. Laria blinked, rapidly. Yes. The outgoing CEO of Re-Awakened Technologies. One of the reasons she had sought out the corporation. /That/ was what it meant to be sassy. Two hours later, the previously bare wall of her quarters was covered in a near-lifesize poster of Evanda Char in what Laria had judged to be her "sassiest" pose. Well. She still wasn't quite sure what that meant, but Eva at least looked jaunty. Stuck over the bottom of the poster was a note, which read "Be like this!". Laria posed in front of the mirror. No, that just looked awkward. She shifted. That was no good either, it looked like she had hip pain. One more try. Yes. That was better. Slight undertones of "needing the facilities", but it would do for a base. Provided she didn't have to move. Still, she ticked off "Stand sassily" on her datapad to-do list. Next was "Walk sassily."